It's the Squadron Scramble, sir! Don't be wet! We've only just come down, we're still refueling! 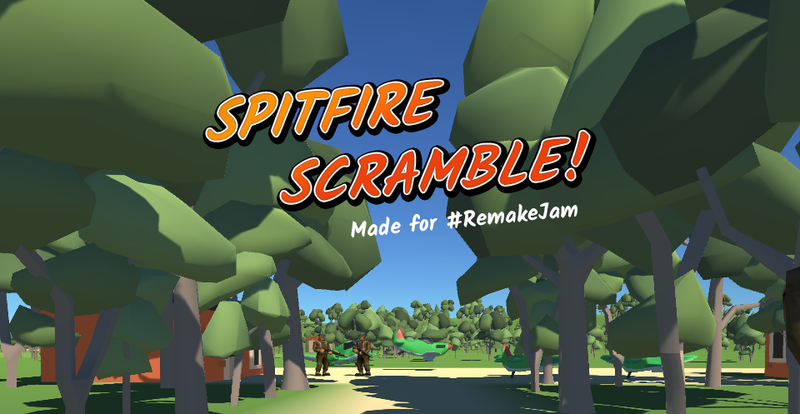 Spitfire Scramble throws you into the Battle of Britain as the RAF scramble to meet the incoming Luftwaffe bombers. 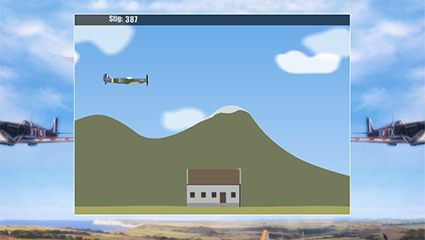 Take off, Take down the enemy aircraft and defend the local factory for as long as you possibly can! Don't just stand there! Get one up! This game was made as an entry for the #RemakeJam. While the jam allowed for a week to complete the game, I only had around 72 hours to spend at it. For that reason, the game is in poor gameplay quality, bugs are to be found, and any polish is obviously lacking. Sounds are from bfxr.net. I would have loved to have proper sounds but there was simply no time for it. Majority of the work I put in was the coding. I coded everything with help from my friend Marco Bancale, along with the internet, as per usual. I did buy and use the Off Screen Indicator, to help me with something that would have been impossible for me to program. Despite the code I put together is really bad and ugly, I'm quite proud of it as a non-programmer. Damn it Jim, I'm an artist, not a programmer! I made my first game back in 2005, in Macromedia Flash (Yes, before Adobe bought Macromedia). It revolves around steering an airplane, Spitfire, up and down to avoid flack explosions. It's fundamental flaw was it was entirely built on luck as there was no way to know where the next random explosion happened. Ever since I made that game I've wanted to remake it. Make it better, more gameplay, less randomness. As soon as I saw that #RemakeJam was happening, I decided to go for it! I decided to make it in 3D, completely change the gameplay, but keep the core setting, steering and flying (and now) fighting Spitfire. So Spitfire Scramble! is born. The idea is born from the Battle of Britain, where the Royal Air Force would scramble their air force up to fight the incoming wave of bombers.